During the cold war, the U.S. and the Soviets raced each other to the moon. On October 4, 1957 the skies were changed by a basketball size object that went streaking across. The size of the object was not the surprise, but how high it was in the sky. It was in orbit and it was man-made. The Soviet launched a satellite, Sputnik, into space and the Space Race began. 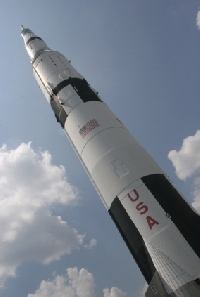 In the early days during the history of the space race, the U.S. was unable to produce a successful launch. Embarrassing failures were shown on TV, with rockets blowing up on the launch pad or launching and spinning out of control. The Explorer project was created to put a satellite into space. Explorer I was the first satellite. Officially known as Satellite 1958 Alpha. As the Americans were struggling to get anything in orbit, the Soviets were ahead and introduced the first group of cosmonauts. This included Pavel Popovich, Yuri Gagarin, Valentina Tereshkova, Valery Bykovsky, Andrian Nikolayev and Gherman Titov. All were military pilots except Tereshkova. Meanwhile, seven American astronauts were selected and introduced to the public in 1959. All were military test pilots. These were Walter Schirra, Donald Slayton, John Glenn, Scott Carpenter, Alan Shepard, Virgil "Gus" Grissom, and Gordon Cooper. As the race progressed, the Soviets had programs to get into space and to the moon. The Vostok and Voskhod missions were successful with a series of firsts in space. In 1961 the first man in space, Yuri Gagarin, entered orbit and returned safely. This was followed by the first full day in orbit with Gherman Titov. In 1962 the first two-spacecraft mission with Vostok 3 and 4 occurred. In 1963 the first long-duration mission of five days in orbit took place. The Soviets also put the first woman in space, Valentina Tereshkova. In March 1965 Aleksei Leonov became the first person to exit the spacecraft for a spacewalk spending 20 minutes outside in space. Meanwhile the U.S. manned spaceflights were successful. The Mercury program involved one astronaut in the spacecraft. The Gemini program involved having two astronauts in the spacecraft. In May 1961 astronaut Alan Shepard went briefly into space, but not into orbit. Then in February 1962 John Glenn spent five hours in orbit. And the first US spacewalk occurred in June 1965, Gemini IV, with astronaut Edward White. The Mercury and Gemini missions carefully prepared the way for the Apollo lunar missions. The Apollo missions were designed for three astronauts in the spacecraft. Two would be used to pilot the lunar lander, and one in orbit around the moon. The Soviets also had several different programs to explore the moon. One was the Luna A. It provided a variety of automated orbiters, landers, and soil sample return capsules. The L-1/Zond program involved automated circumlunar missions. The Soyuz and Kosmos program were designed for human and automated missions in earth's orbit to test lunar spacecraft and maneuvers. But only 20 of about 60 Soviet launches of all types of lunar probes from 1959 through 1976 were successful. In September 1968 the Soviet launched the Zond 5 unmanned test flight which looped around the moon and returned to earth. This was followed in October with the U.S. launch of the Apollo 7 manned test flight. But the Soviets followed with the circumlunar flight of the unmanned Zond 6. The Soviets in December canceled a manned flight to the moon after the October Zond launch problems were not rectified. Meanwhile the Apollo 8 crew orbited the moon and returned safely. In 1969 the race was in the final leg. In February the Soviets attempted to launch the N-1 Moon rocket but it failed. In March NASA tested the Apollo 9 lunar module in earth orbit; it was successful. Then in May the Apollo 10 test flight a lunar module involving a descent from a lunar orbit to a low altitude above the moon was successful. The Soviets, however, continued to try to get to the moon. In July the second Soviet N-1 launch failed. And in a last ditch attempt, the Soviets launched the Luna 15 lander for robotic collection of moon rocks and it was supposed to return to earth, but it crashed on the moon, just after the American landing. On July 21, 1969 two Americans, Neil Armstrong and Buzz Aldrin in Apollo 11, stepped out of their lunar lander onto the Moon and successfully returned three days later to earth. The history of the space race shows that there were many successes and firsts by the Soviets, but more by the Americans. It was a close race.